Ecological way to convert kitchen scraps into compost for the garden. 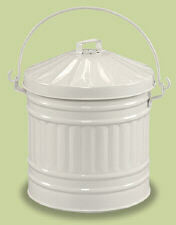 Dump collected organic material from this pail into a composter to make fertilizer for plants and vegetables. Retro trash can design in white enamel powder coat finish. Includes two replaceable carbon filters to eliminate odors. Ecological way to convert kitchen scraps into compost for the garden.